London is a very busy city with lots of different railway lines and lots of freight yards and traction depots. One of the questions that is frequently asked about tripping to London by spotters is: what are the best stations to see freight? 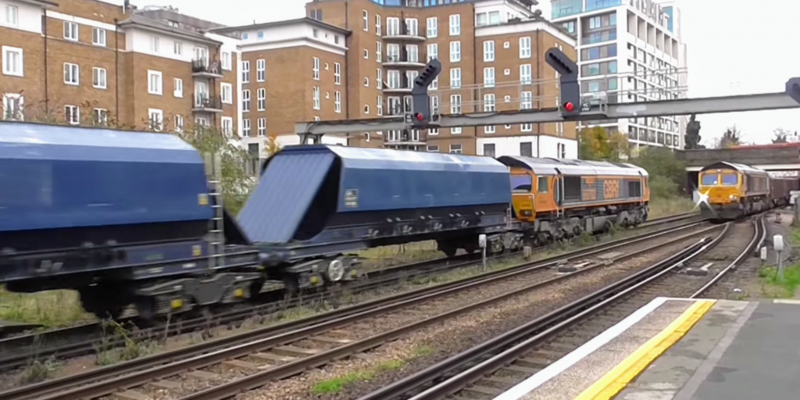 This article will share what we have found to be the best stations in London to see freight trains. Different types of freight trains come from different locations so will use different lines. The below stations in London take the many different types of freight traffic into consideration so you can make the most of your trip. Watford Junction is located in North London on the West Coast Mainline, a short journey from London Euston. Watford Junction has its own concrete / aggregates yard, as well as some civil engineers sidings where you might be able to phot some interesting track machines or discarded wagons. 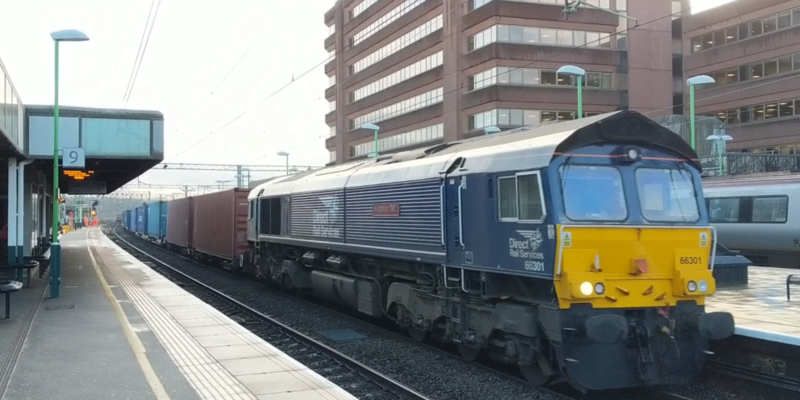 Freight traffic through Watford Junction is usually intermodal container traffic to Hams Hall, Felixstowe, Crewe and Southampton but you also get some aggregate trains and occasional steel train from Dollands Moor. Some days there is also a DB Royal Mail class 325 from Willesden Princess Royal to Crewe or Warrington. The best time to go to Watford Junction would be from lunchtime until 1400. The reason we have suggested Watford is that you can get good shots of the fast platforms without having to worry about a fence. There is also a few high rise buildings nearby and buildings on each platform to shade from the sun. The above photograph shows a DRS Class 66 with a train to Daventry heading northbound through Platform 8. Class 66 hauled trains are very common here, but class 86 and 90s are also often seen on intermodals. 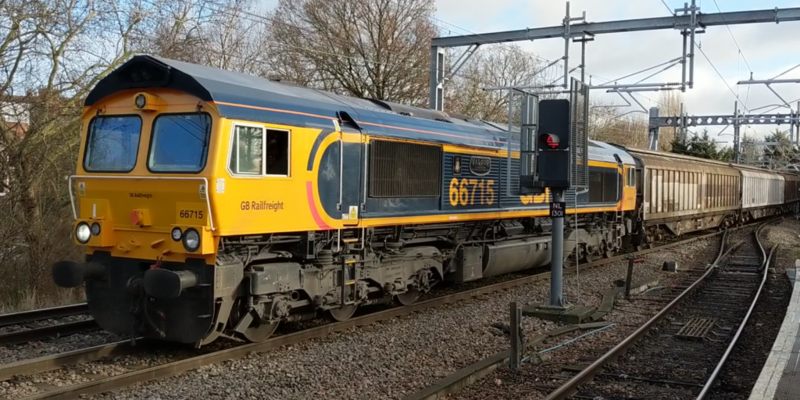 You can see todays freight services at Watford Junction by clicking here. Gospel Oak is a great station because freight traffic comes from two directions, from the Gospel Oak to Barking line, and from Camden Road area on the North London Line. Trains often seen here are from the London port from Tilbury, London Gateway and Dagenham/Ripple Lane. GBRf 66715 passes Gospel Oak with a train from ripple lane. Historically, the best time to go to Gospel Oak is between 9 and 12, as a lot of aggregate trains run, in addition to intermodal trains and the colas Hoo Junction to Whitemoor. The whole of the North London Line is usually very good for freight traffic, especially intermodal although intermodal trains usually miss out Gospel Oak so for these I would recommend Caledonian Road and Barnsbury. Caledonian Road and Barnsbury has 2 platforms situated in an island with 2 tracks on each side. The approach and departure into Caledonian Road and Barnsbury is single track which splits into 2 then back to 1 so its unlikely you’ll get bowled here as only 1 train in each direction can travel at a time. Kensington Olympia is one of the best places to see freight in London, and I am sure others will also tell you that. In a 3.5 hour visit on a Wednesday we saw 12 freight trains. We also saw a few other keen enthusiasts at Kensington Olympia who had the same idea as us. We also saw a freight crossover twice. The majority of freight traffic through Kensington Olympia is aggregate but there is also some steel traffic and intermodal trains from Wembley or Dollands Moor. Two GBRf Class 66s cross over at Kensington Olympia railway station on the west London Line. The best time to go is between 10am and 2pm we have found although this may depend on freight requirements. Willesden Junction is a top spot for seeing freight trains coming from all different directions across London. Located a short walk south from the station, there is a fantastic footbridge which enables you to get photos of intermodal trains heading north up the West Coast Mainline. A DB Schenker class 66 climbs up into Willesden Junction high level from the GWML. It is common to see aggregate trains from Acton and the GWML as seen in the photo above, and from Mitre Bridge Junction. The best time to go for WTT timetabled trains that usually run weekdays, would be between 1100 and 1300. 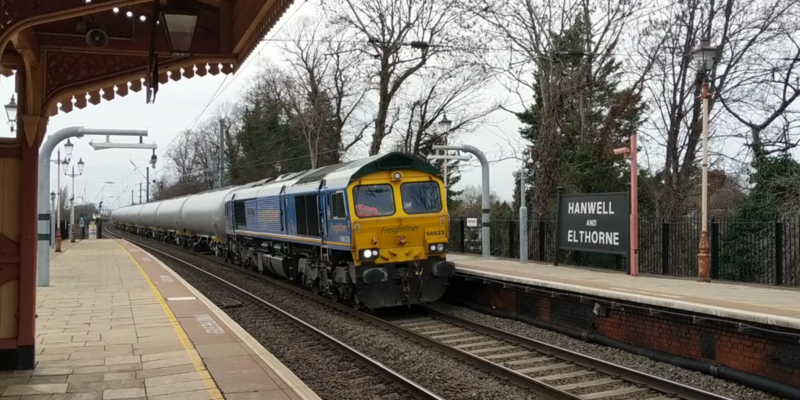 Sporting its unique blue livery, Freightliner 66623 passes Hanwell railway station working Colnbrook to Grain fuel tanks. Hanwell is located on the Great Western Mainline between West Ealing and Southall. Hanwell is a nice station because you can see for quite a distance in each direction. Passenger volumes aren’t too bad either so you can get some nice photographs. Aggregate trains are very common at Hanwell, with plenty of jumbo trains between Merehead/Whately and Acton yard. Also seen sometimes are fuel trains like the above which ran West Drayton (Colnbrook) to Grain BP. Colnbrook to Lindsay oil refinery train also runs some days which is usually a colas class 70. Southall is also a good station to visit, but it was quite a busy building site when we went so lots of builders fences and machines lying around. We recommend Hanwell because the station staff are friendly and let you get on with it. We hope this guide has been useful. If you know of any other good stations for freight traffic in London, why not comment below?